BATON ROUGE, LA – SU Ag Center youth are excelling on all fronts. Daisha Christine Badon once again had an opportunity to do something exciting and special with her God-given talent. In September, the LSU Athletics Department and the LSU School of Music selected Daisha to sing the national anthem at LSU Athletics events this year. She performed at the LSU Women’s Basketball game in the Pete Maravich Assembly Center, December 18. Badon is a graduating senior from Brusly High where she has been a member of the school’s choir and the talented art program. 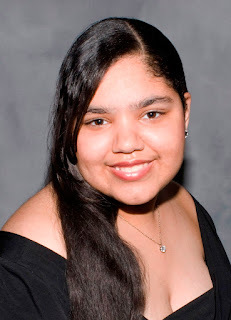 She currently sings with St. John the Baptist Catholic Church Youth Choir, under the direction of Celeste Veillion and studies piano with Ronald Perry of Baker Music. In addition, Daisha enjoys dancing. She is celebrating twelve years of dance education with Machita and Company of Port Allen. After graduation from high school, she plans to major in music and performing arts, and further her education at the renowned Julliard in New York. Badon is the daughter of Dwayne and Donna Badon of Brusly, and big sister to Dara. 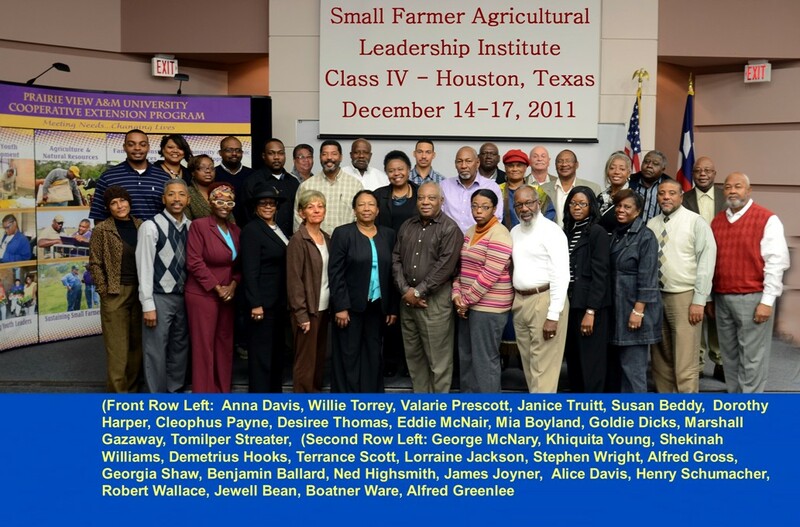 Baton Rouge, LA - The Southern University Ag Center based Small Farmer Agricultural Leadership Institute, Class IV held its second training session at Prairie View A&M University in Houston, December 14-17. 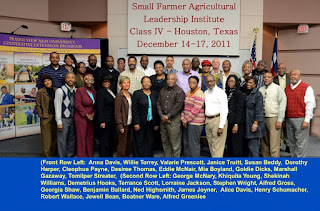 The group consisting of 31 participants from 12 southern states came together for farm tours and classroom lectures. The first stop was Yonder Way Farm, which began in 2006 when owners Jason and Lynsyn Kramer decided to live out their dreams of owning a farm. Their business goal is to be good stewards of the land and raise their animals free of confinement in a natural environment. Classroom lectures included lessons such as, team building, leadership, diversity training, farming as a business, and creating a resource inventory. In all, 47 individuals attended the event. For further detail, please contact Mellion-Patin, Project Director at (225)771-3532. Baton Rouge, LA – The Southern University Ag Center was spotlighted in the December issue of USDA National Organic Program Insider Newsletter. The spotlight followed a September visit to Louisiana by Miles McEvoy, Deputy Administrator of USDA’s National Organic Program (NOP). During his visit, Dr. C. Reuben Walker gave McEvoy a guided tour of the Ag Center. Walker serves as one of 15 National Organic Standards Board (NOSB) members. He succeeds Professor Owusu Bandele who served on the board from 2000-2005. The federal statutory board advises the Secretary of Agriculture on Organic policy. The Board meets twice a month to address organic agriculture issues. The National Organic Board’s Organic Insider newsletter mentioned SU Ag Center on page 1 and spotlighted it on page 11 of the December issue. The spotlight focuses on the Center’s organic and sustainable agriculture production activities. The Organic Insider has a wide readership of approximately 3,500 internationally. The full article is available online at http://www.ams.usda.gov/AMSv1.0/getfile?dDocName=STELPRDC5090466. Baton Rouge, LA - The US Department of Agriculture has identified the Scotlandville community as the largest "Food Desert" in Baton Rouge. More than 18,000 people live in Scotlandville, and 89% of that community has "unacceptably low-access" to quality food. 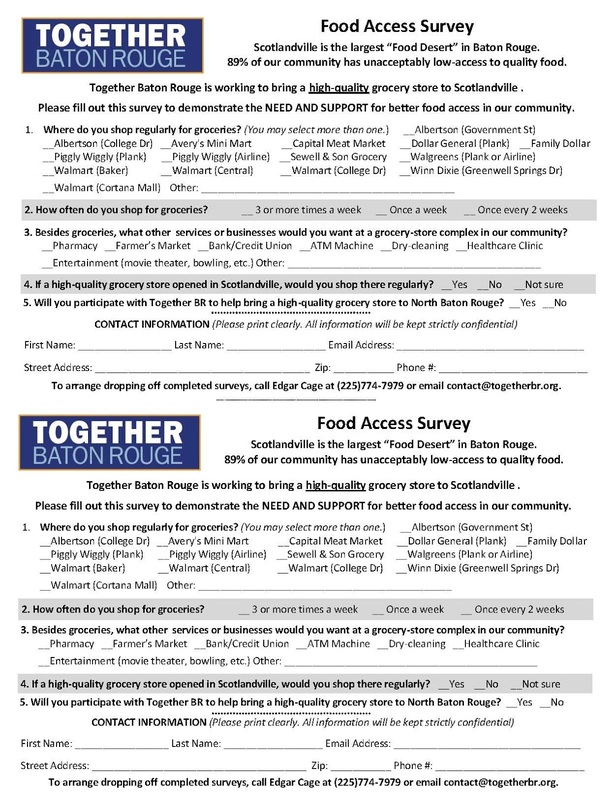 The Together Baton Rouge (TBR) Food Access Team is working to bring a high-quality grocery store to Scotlandville, to address this food desert. 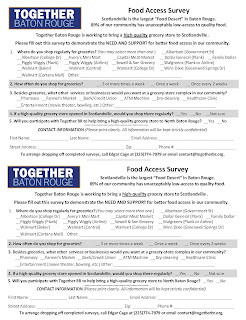 The TBR is conducting a "Food Access Survey" to demonstrate the need and the support for better food access in North Baton Rouge. Several congregations are planning a SURVEY SUNDAY on the Sunday before Christmas, to share this information and build a large base of survey participants. Citizens located in, or near Scotlandville are encouraged to participate in the SURVEY SUNDAY-December 18. The survey is attached. Baton Rouge, LA - The USDA has proposed a traceability rule for livestock that will require identification for animals that enter interstate commerce. The purpose of this rule, called the Animal Disease Traceability Proposed Rule, is to find the source of any disease outbreak quickly. Cattle, horses, goats, poultry, swine are among the livestock included. The rule is to take effect in early 2013 and the states will administer it. In addition to identification, veterinary health certificates will be required for all animals not covered by an exemption.